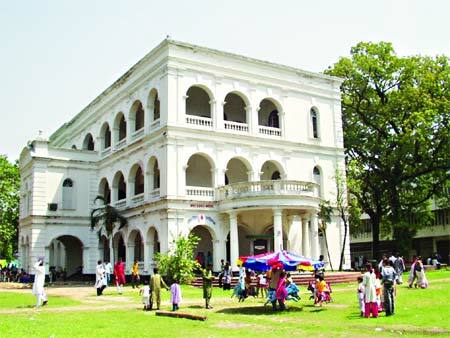 The 54th founding anniversary of Bangla Academy, a centre that upholds the spirit of Bangla language, literature and culture, will be celebrated today in a befitting manner. The academy has chalked out an elaborate programme to mark the day. The programme will began with placing wreath at the Central Shaheed Minar at 10:00am. A commemorative speech will be delivered at the seminar room of the academy at 4:00pm, which will be followed by a solo concert of singer Papia Sarwar. The Bangla Academy launched its journey on December 3, 1955 under the auspices of the then United Front Government that came to power after the 1954 general elections. Chief Minister of the then East Bengal Abu Hossain Sarker inaugurated the academy. Education Minister of East Bangla Ashrafuddin also addressed the func-tion held at Battola of Bardhaman House. The provincial government had earlier formed a preparatory committee on November 26, 1955 to establish the academy. After the inauguration, Mohammed Barkatullah was appointed special officer as the chief executive of the academy. After his retirement on December 1 in 1956, Muhammed Enamul Haq was appointed its first director. The Bangla Academy had started its activities with four sections, which were expanded to six by the preparatory committee in its 10th meeting on May 18, 1957. These were research, translation, compilation, publications and sales, culture and library. After Independence of the country, the President of Independent Bangladesh promulgated the Bangla Academy Order 1972 on May 17, 1972 and the Central Board for Development of Bengali was merged with the academy. Under this order, the academic council was renamed as executive council and post of director general was created. The head of the Bangla Department of Rajshahi University Professor Mazharul Islam was appointed the first director general of the academy. By 1983, the number of its sections was increased to 10 as finance and planning, establishment, folklore and textbook sections were included in the existing ones. So far, the academy has published over 1,200 books on language, literature, education, science and culture. Besides, the academy organizes various programmes round the year including one of the country’s major event ‘Ekushey Boi Mela’. The Bangla Academy Award is being considered as the most prestigious recognition in the country’s arena of literature.